Last week, Elita at Blacktating.com wrote a post about an upcoming book that came across her desk. (She works for the library system and is therefore, even more of a hero to me.) Anyway, the book is entitiled: Is Breast Best? : Taking on the Breastfeeding Experts and the New High Stakes of Motherhood. I am not going to discuss the book here because Elita does a good job on her page, but I am going to give my hypothesis as to why we are still dealing with these mommy wars. -Helicopter Parents: We have a whole generation of parent afraid of letting their kids make mistakes or getting hurt that they will hover near by and swoop in as soon as a danger (real or imaginary) presents itself. Now, don’t get me wrong, if your kid is in bodily harm- swoop, swoop away, but if your kid is over the age of 18… it’s time to stop swooping. -I know a woman who is a Nursing Professor, teaching graduate level nursing courses here in Missouri and she has had to field irate phone calls and emails from the parents of her students (mind you, this is graduate school so these students are at least 22 years old.) These phone calls are usually to discuss/ argue against bad grades. Because of the privacy act, the professor is not allowed to discuss the grades with the parent, but that does not sway them. -Many people, my age or younger, are afraid of making mistakes because of the Everybody plays, Everybody Wins mentality and as a result, we have the Mommy Wars. We have a group of parents who grew up being told that they could do no wrong and that they were perfect in every why that when they encounter a teaching or philosophy that is counter to their own held beliefs the effort is put forth to discount/ disprove that counter-philosophy. Statement A: A potato from the garden is superior to processed, fast food french fries. French Fries will fill you up and keep you from being hungry, but it is not the same as the potato. Manufacturers try their best to make the french fry nutritionally equal to the potato but as close as they come, it’s still a french fry and not a potato. Statement B: Breastmilk is superior to Formula. Formula will fill you up and keep you from being hungry, but it is not the same as Breastmilk. Manufacturers try their best to make formula nutritionally equal to the breastmilk but as close as they come, it’s still formula and not breastmilk. While most people would not call statement A false, there would be plenty out there to say that statement B is false, even though the only change was in 2 words. So, where am I going with this? Breastmilk, Formula, Homeschool, Vaccines, Fast Food, Juice, Wooden Toys, etc., etc., what ever parenting choices you make you have to be confident that you made the right decision for your family. My SIL hated breastfeeding and therefore did not continue very long. My SIL is a strong, confident woman and knows that she did the right thing for her family. But she also knows that formula is not the same as breastmilk and is not going to convince herself otherwise. What is right for my family is not right for my BFF’s family and we need to stop pretending that every family is the same in every way. But with that said, breastfeeding advocates are not going to stop giving the facts about the nutritional superiority of breastmilk because there are mamas and mamas-to-be out there who are still deciding and discerning what feeding method is right for them and they deserve all of the facts. Maybe what we all need is a little dose of humility and we need to stop trying to be the best at everything. After all, in this life not everybody is going to play and win but once we are with Jesus and get our crowns, all of this stuff will just be noise. So what are your thoughts? Are you a Helicopter Parent? Was “Everybody Plays, Everybody Wins” a good thing for us? Are we, as parents, just neurotic? As an aside, this is my 100th post!! If you’ve been reading all along, thanks! If you are a new reader, there are 99 other pretty good ideas to read! I am really sad to say, that my only negative nursing in public experiences have come in my home State of Wisconsin. The first happened almost a year ago, and you can read about it here and the second happened this past Saturday at the Beaver Dam Country Club (which, is not as toney as it sounds.) It’s funny. Their motto is “Where Strangers Feel Like Family.” Let me know your thoughts on that one at the end. Dear Husband’s (DH’s) cousin was married this weekend to a lovely girl he met at Madison. The ceremony was beautiful, held at the Wisconsin State Capital Building. We got there in the nick of time and as a result were seated in the Gallery section, which offered a great aerial view of the wedding plus we were in comfy theatre style chairs which made for easy nursing. After the wedding we headed to the Great Dane for a quick microbrew and then headed up the road to the country club. There was lots of milling about during cocktail hour and The Dragonfly wanted Mama milk so I obliged while at the tables around the bar. (Wisconsin is smoke-free which I find great, so there was not pesky smoke to bother us.) While we nursed, I chatted with family members and all was good. After cocktail hour, Steve’s Uncle had us all come outside. He is an amateur naturalist and cultivated over 1000 Monarch Butterflies for a butterfly release. It. Was. Gorgeous. It was as we were coming back into the club when it happened. This schmuck, whom I later found out was the husband of this really nice bridesmaid I met, and he cronies said just loud enough for me to hear as I walked past “There goes the Breastfeeding Queen” in this snide tone of voice. Of course, anger flared up in me but I decided to turn the other cheek rather than confront a drunk idiot. DH noticed my dour mood and asked what was up. Of course, I told him and he was ready to throwdown. DH is not what I’d call a lactivist by any means, but you do not mess with his family. I tried to put it out of my mind, but it’s hard when you are criticized by someone you don’t know over something as innocuous as feeding a child. And, no, I don’t believe that a breastfeeding mother should have to hide away because she is doing something “private.” Peeing is private. Eating is not. And to be honest, more breast is seen in Abercromie and Fitch ads or on the beach or at the mall than what I was showing in breastfeeding. I love my home state and I know that the actions of a few do not a reputation make but I really feel for moms who maybe aren’t as confident in their nursing. What would she have done when faced with such scorn? Formula feeding moms want to know why breastfeeding moms have to be all up in arms about breastfeeding in public and this is why. No one thinks twice about a mom bottlefeeding and the same should be said for breastfeeding. 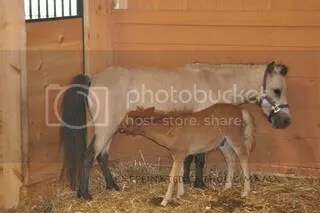 We were fortunate enough to witness this tender moment between a mama pony and her baby foal at Schopf’s Hilltop Dairy Farm in Door County, Wisconsin. Because I fully believe in equal representation, I feel it’s only right to compile my Top Ten Worst Things about Breastfeeding to balance yesterday’s post about the Best things. 8. Three words: Random. Milk-ejection. Reflex. 7. When parents hustle their children away from me, like I am a pariah, when I sit down to breastfeed at the park. 1. Explaining to people that, yes, my baby is still nursing at 3 months… 6 months… 9 months… 12 months… and beyond. I am sure you have some personal points to add to this list! Do share!